Like gold, we horde what we’ve learned about education and expect to live off the interest for the rest of our professional lives. Tossing it out with the garbage is unthinkable. Crazy. Yet we also know that we can’t re-envision or change education as long as our slates are filled with the dusty remnants of prior learning. The idea of unlearning, of wiping the slate clean, of “swimming in the opposing direction” to envision change is not new. It has a long tradition in Eastern philosophy, and educators such as Karen Windeknecht and Brian L. Delahaye, in “A Model of Individual and Organisational Unlearning” (Proceedings 18th annual Conference of the Australian and New Zealand Academy of Management, 2004), say that “The major reason for encouraging or engaging in unlearning is to allow the inclusion of new information or behaviours, and as a means to assisting learning, innovation and change” (3). Emily J. Klein, in “Learning, Unlearning, and Relearning: Lessons from One School’s Approach to Creating and Sustaining Learning Communities” (Teacher Education Quarterly, winter 2008), defines “unlearning” as “letting go of deeply held assumptions about what it means to be a teacher, what classrooms look like, what the essence of teaching and learning is” (80). However, unfortunately, she leaves us with a bit of wiggle room to keep some of the old stuff on the slate by saying that “a certain amount of unlearning or changing of beliefs is necessary for any school reform” (95). Obviously, any vision of reform will retain some of the old, but Klein’s “a certain amount” is vague and an open invitation to retain enough of the old to doom any chance for meaningful change to emerge. The problem in education is that we’re not giving unlearning a fighting chance to show us what the possibilities for change and innovation are. What are we afraid of? It’s only thinking. It’s not as though we’re going to bulldoze and dump what we have before we’ve had a chance to invent a better model. The first step is just a mental picture, an idea. Nothing more. If we determine it’s worth developing, then we will. If not, then we won’t. If we’re willing to risk this first step, then the question is, how do we create a vision of a model we’ve never seen? The answer is simple and as old as time itself but also baffling. Imagination. We use our imaginations. Here’s an exercise some of us might want to try. (See the “school” box above.) It should be familiar. It’s called thinking outside the box. 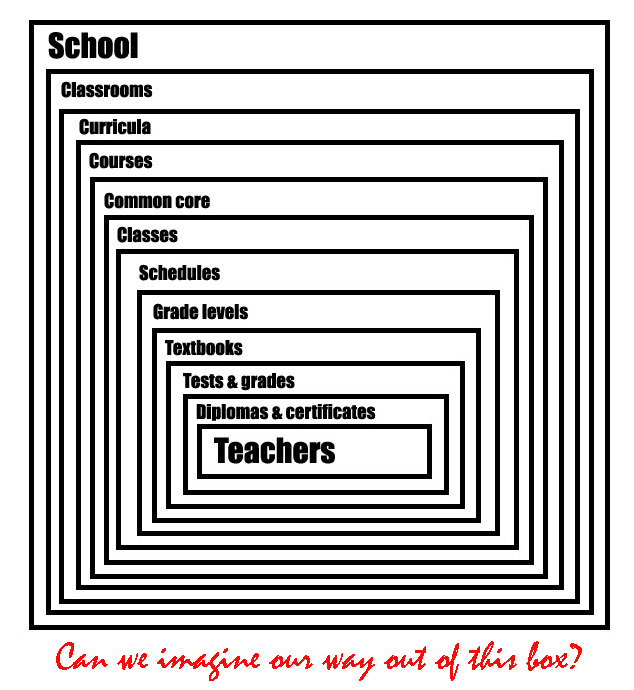 As long as we stand inside the box, our ideas of what education can be will remain pretty much the same. The challenge is to step outside the box and, without looking back, to rethink education. Can we imagine models of education that are completely free of the elements in the box? Can we describe and discuss education without relying on the vocabulary that kept us rutted in the old model for over a century? With today’s computer and web technology, this is no longer just an exercise. We have the tools and resources to construct a new vision of education. All it takes is imagination. A little humor: Education is the third most conservative institution in the country (or world) — [wait for it] — after monasteries and nunneries. The point of this little one-liner is that Jim’s out-of-the-box thinking is crucial to change in education. We know that education must change for reasons both of push and pull. But, wait a moment. Education should be conservative. Otherwise, fads will invade our schools to the detriment of our students, not to mention school budgets. I think that they already have to some extents as evidenced by interactive whiteboards (IWBs) and iPads popping up everywhere in K-12 education. IWBs have some benefit in special situations, especially special education, but have large costs of acquisition and maintenance. The iPad is way overpriced for its educational value for high school and probably middle school too. It’s fine to think outside the box. It’s a good idea to do so often. Just know that you’ll have one good idea for every 100 bad ideas you come up with. Thinking outside the box is just the first step. The second step is critical evaluation of those ideas. What are the push and pull of change in education that demand we do more out-of-box thinking? The push comes from high K-12 dropout rates and declining college graduation rates along with problems related to economic globalization — such as graduating more non-immigrants in science and engineering. (I’m not against having immigrants in our schools; I just think it should be by choice and not out of necessity.) You can see increasing illiteracy every day here. People are science illiterate in their responses to environmental crises. I see ads from major companies with serious spelling and grammatical errors. Few people understand simple percentages in the context of claims from advertisers and politicians. On the pull side, young people are not willing to set in classrooms for hour after hour and listen to someone they usually don’t respect drone on about a subject that has no meaning for them. The entire world is at their fingertips these days. Re-imagining education has the hope of changing this attitude. As we do so, realize that everyone loves a good challenge. That includes our students. Ask your students to climb real mountains (metaphorically) and not molehills. Just don’t ask for the Matterhorn or Everest. So, the pull comes, in large part, from technology. Logically then, so should the solution. While you may come across your good idea for changing education from seeing some technology in a non-education setting, you should understand that most technologies do not simply translate from business or consumer environments into education ones. You’ll have lots of work to do. Take the idea and see what you can do to make it work pedagogically well. Remember that IWBs began as a corporate presentation tool, and the iPad is consumer electronics. Don’t expect to drop any non-educational technology into a classroom and see magic happen. Great teachers are not created by technology and aren’t dependent on technology, but they know how to use it if given it even if it’s not for education. For the rest of the teaching profession, technology must be built to work for them, to complement their teaching strategies, and to help students learn whether or not the teacher is wonderful. So, get out there, way outside of the box. Don’t stay inside by just adapting something shiny for a classroom. Go the extra yard. Think big. Check your ideas. Toss the bad ones. Keep the good ones. And get ready to do some hard work. Harry: On the pull side, young people are not willing to sit in classrooms for hour after hour and listen to someone they usually don’t respect drone on about a subject that has no meaning for them. The entire world is at their fingertips these days. This is exactly the kind of out-of-box thinking we need to cultivate in our profession. In this one scenario, we have most of the traditional components of schooling: classroom, class, course, common core, schedule, grade-level, teacher, lecture, and probably more. When students have the world of info at their fingertips in mobile devices as well as laptops, why shoehorn them into this suffocating box? We can and should think of ways to use tech to pull them into subjects that interest them and create individualized learning programs (ILPs) that allow for a wide range of learning processes. If a 7th grader is fascinated by dogs and how to select and train them for the blind, build her ILP around this interest, guide her toward online communities of like-minded students of various ages as well as select practitioners in the field. Her study and projects could grow out of subject-relevant material and resources that are appropriate for her level. In other words, don’t clutter her path with push learning in lock-step cohorts. Imaginative and flexible ILP advisors could think of infinite ways to add other skills to her projects, including math, science, art, writing, reading, history, etc. The difference would be intrinsic motivation, or pull. Now the student has a reason for learning how to measure and collect data, how to research best dog training practices, how to compute and write reports, how to be persuasive, etc. Forget grade-level. The 7th grader could work with a scientist at a university oceans away on a project involving a breed of dogs that aren’t currently being used for work with the blind — or a professional dog trainer in China who uses techniques that aren’t familiar in the West. If his English is poor and her Mandarin is nonexistent, they could initially learn to communicate in their area of common interest. Gradually, their communications could grow into other areas. If child-care is an issue, then have her report to a protected learning site (PLS) where she can socialize with peers and independently or in similar-interest-groups pursue projects and tasks related to her ILP. The PLSs ought to be architecturally flexible, comfortable, secure, and well equipped for online learning for individuals and small informal groups. They should include staff who are trained to facilitate ILPs. Sports and other extracurricular activities could be handled by community organizations, public as well as private sector. The point is that once out of the box, the world of options for pull-oriented learning suddenly becomes a reality. Thank you for your thoughtful reply to my response. The utopia you paint has one problem — mentor time. Eventually, we’ll find ways around that. In the meantime, IMHO, we have to take feasible steps forward in your general direction. I see the first steps as being adaptive learning and learning to mastery. The student should have the flexibility to bring in interests such as dog training. However, we just don’t have the bandwidth today to do it the other way around. Our teachers are, of necessity, experts in specific fields (or should be anyway). Having them adapt their subject expertise to an education program for 150 (or more) different ILPs would seem to be a reach today. As education technology advances, this dream will become possible. I love brainstorming and these incredible ideas for the future, but from my viewpoint, it’s about actually taking those initial steps and doing so without the usual very long delays. Harry: Our teachers are, of necessity, experts in specific fields (or should be anyway). Having them adapt their subject expertise to an education program for 150 (or more) different ILPs would seem to be a reach today. Good point, Harry, but it underscores the reason we need to step outside the box. Your 150-to-one holds true only if we continue to schedule classes the way we do. The staffing actually works out to roughly 25-to-1 if we don’t have students moving from class to class for different subjects. If we don’t have classes as we do now, then individual learning program (ILP) advisors would have an entire day to meet with their 25 clients, individually or in small groups, F2F or virtually, synchronously or asynchronously. Social media platforms provide additional dimensions for interactivity. Flexible scheduling would allow advisors to match their schedules to student needs, and it might mean meeting once a day or once a week. With online options, scheduling becomes even more flexible. No, current teachers aren’t trained to facilitate ILPs, but they can learn to do it. In fact, the current trend toward project learning would dovetail nicely with a move toward ILPs. Furthermore, the trend in best practices is toward guiding or facilitating learning rather than leading it, pull rather than push. Again, the idea of facilitators as ILP advisors flows with rather than bucks this trend. In this and my earlier response to you, I’ve tried to stay clear of the words in the box. I’m not sure if I’m succeeding, but the idea is to unlearn or get out of the rut that we’re in when we limit our imaginations to in-the-box lego elements. In other words, if the only tool we have is a hammer, then we’ll treat everything as if it were a nail. For a moment, let go of the hammer, the traditional model for schooling, explore the tools outside the box, and see if we can’t build a newer, better model. Absolutely, brainstorm far outside the box. Know that really good ideas are rare and that you’ll probably have to throw away handfuls to find that one nugget. The issue I’ve addressed with ILPs has to do with SMEs being available for a ton of students. One coach cannot be an expert in all fields. Despite blurring of lines between disciplines, there are still distinct modes of thinking and knowledge bases among them. One person cannot truly mentor an ILP student well. This business of thinking is the key for me. I’m a big fan of having lots of modes of thinking. We think intuitively, creatively, critically, and so on. Intuitive thinking is our natural mode but still should be trained. The other modes must be learned, although it may be true that young children are naturally creative and have their creativity removed through unimaginative schooling. My own special area is scientific thinking. I know that I tend to be a bit chauvinistic about it but have some good company in Carl Sagan. Only those who know how to do it are good at teaching how to do it. It won’t come from reading a book. You have to practice. This practice is considered hard work by most and so is often avoided. Even science teachers will avoid teaching it. I don’t know how many similar things we should learn in our schools. I expect quite a few. Good communications skills across many media comes to mind as an example. Independent learning must be guided well so that the result is not unbalanced. In an ILP universe, you won’t just be helping students find the right courses to take from a list. That’s the old way, the way in which the person responsible for the course was also responsible for seeing that the right learning takes place — even though it often fails to do so. I see well the option of students choosing projects within today’s framework, whether or not in classrooms. I don’t see the option, in the near future, of a teacher designing projects, several per year, for every student’s whim and having that design cover all of the bases. As you know, I’m no fan of seat time, scheduled learning modules, high-stakes testing, sitting bored in a classroom because you have to, or any of the other annoying aspects of today’s education. I’m also a student of education history and have seen too many attempts at reform fail. Often, that failure occurs due to a lack of respect for realities. Sometimes, it’s lack of scalability. Others, it’s due to poor marketing to the end-user, the teacher. I know I’m veering away from the primary topic here. It’s tough to be selling, in whatever sense, something where the true end user, the student, has no say in the decision. Teachers often have no say in choosing what path to take or what product to purchase, but they can quite readily refuse to use it once it’s in their classrooms. So, every “sale” must take place at three levels — or more. Even when you can show a teacher true teacher nirvana, the teacher may just say no for reasons that don’t relate to the quality of learning or of that teacher’s life. So, pick your favorite out-of-the-box new world of education. Then, figure out how you will get there one step at a time. I can guarantee that you won’t do it in a single leap, not in education. But, being an optimist, I’m going to continue to make the attempt to move ahead as many steps as I can at a time and plan for the follow-on steps. Harry, thank you for joining me in this “what-if” adventure to think outside the box. The points you’re making are forcing me to think of new ways to solve old problems. We should keep in mind, though, that we’re not making any decisions or judgments in this exercise. There is nothing at stake so no one wins or loses. This is purely a what-if game, an exercise in thinking out loud to see what pops up if we step outside the confines of traditional schooling. Harry: One coach cannot be an expert in all fields. Despite blurring of lines between disciplines, there are still distinct modes of thinking and knowledge bases among them. One person cannot truly mentor an ILP student well. What if that “one person” we’re talking about is an “advisor” and not necessarily a subject area “mentor” or “expert in all fields”? Her task could be to assist in developing a student’s individualized learning program (ILP). Also, outside the box, there are no limits to the number of mentors or teachers a learner can have at any given time. Thus, part of a learner’s ILP will probably include one or more subject area consultants and experts from the local and virtual community, in both the private and public sector. Harry: I don’t see the option, in the near future, of a teacher designing projects, several per year, for every student’s whim and having that design cover all of the bases. What if the teacher isn’t designing the project alone? She could work with the learner. The learner, independently or in a similar interest small group (SISG), will do much of the leg work. Also, a single design doesn’t have to “cover all of the bases” of learning skills or subject areas. The objectives will determine the “bases,” and learners will acquire skills as they’re needed. This will be unlike traditional schooling where students all learn the same subjects and skills at the same time for the purpose of passing tests. Re “student’s whim” — what if the selection of a subject for study is educative even when the student learns it’s not what she wants? Perhaps it’s a flaw in the program design or planning process or, as you say, just a whim. However, learners and advisors, both, will learn, perhaps after a few trials, how to separate whim from genuine interest. This jerky, start-stop-start process may just be the natural course for learning — a kind of recursive circling of an interest to discover points of entry and paths that work for the learner. Even when this occurs over months or even a year, the process could still be educative. My guess, though, is that interest will win out. If the learner is drawn to art, for example, and is assigned to an art advisor, the advisor, if skilled, will learn, after a talk or two, what kind of art might lead the way to a lifelong passion. It may be fashion design instead of sculpture, but the learner might discover, on her journey, a love for sculpture as a means to better understand form. Her interest in form might lead to explorations of color and different material, perhaps to movement and on to dance or film or both. And this interest may lead to the study of music and creative writing, and both may lead to programing killer apps. The point is, advisors will need to be imaginative and open, too. When the “correct” ILP design decisions are made, the learning path or paths will become clearer, and instead of three or four different ILPs a year, the learner will have just one from high school through college and grad or professional school and career — but that ILP may have twists and turns that we can’t even begin to imagine. Creativity could be worked into every phase of this (or other) out-of-box model. The advisor-learner relationship can be determined in many different ways. For example, an advisor who’s expert in the sciences could work with learners who share her interest. Likewise, an advisor who is into team sports might work with learners who are also interested in it. A student may enjoy working with an advisor based on personality fit rather than subject area expertise, and that may also be very effective. In this case, the advisor may not have the answers, but may know how to ask the right questions. But you’re right, Harry. All this exercise in imagining may lead to dozens if not hundreds or thousands of duds. There’s no guarantee that it will ever pay off. Most might consider it a waste of time, a fool’s errand. But . . .
About the only thing I can guarantee is that thinking about these things is not a waste of time. Variety is the enemy of making change in education. It’s much easier to change while keeping all students doing the same things. It’s sort of the assembly line model of educating. Let’s face it, hand-made cars cost more, lots more, than assembly line cars. The trick here is to individualize the car to order without giving up the cost savings. They’re already doing it with clothes with the help of some remarkable technology. However, these things take place in stages, not all at once. Keep your mind on your ultimate goal and focus your efforts on the immediate steps in that direction. Stay current with technology and think about how new developments might help implement those steps. I made a mistake. Couldn’t help myself. When I set out to design a new way to learn science, I put in every innovation I could imagine and could, in reality, implement. The result, to me at least, was fantastic, but few people could understand it. I expected people to say, “Wow!” However, most people just did not have enough imagination. Over the years, my wife and I have looked at many different places to live. We never seem to see the place as it is but as we might make it. As a result, we’ve found some good opportunities that others shunned. We’ve always enjoyed making the changes and then enjoyed the changes themselves — receiving double joy for our efforts. I created software to help people learn to think better, to think in ways that they may not today, ways that will help them to have better lives and be responsible members of wonderful democracies. I call this way of thinking “scientific thinking.” It’s a form of critical thinking. Carl Sagan wrote a chapter of a book about it in detail. Someone should also create software that will help people become imaginative thinkers along the lines of Jim Shimabukuro in his comments here. Just as a strong society must have a liberal and a conservative component, so must people be capable of thinking creatively and critically. You shouldn’t have to go outside of your own head for either. Not to say that bouncing ideas around with others isn’t a good idea, just that everyone ought to be capable of playing both roles. And that’s the promise of great education, in my own personal and slightly humble opinion.